Samsung and Apple stepped up their game by introducing wireless charging technology, where your phone automatically charges when laying on a specifically designed electronic pad. But researchers at the UW might have just invented the next great phone charging breakthrough: lasers. The first challenge they faced was how to charge a phone via laser without harming people in the process. Their system includes one main charging beam surrounded by four safeguard beams that will shut down the stronger charging beam when their stream is broken to avoid injury. The second key component is the receiver that attaches onto the back of the phone to convert the energy provided by laser into electrical energy, charging the cellphone’s battery. If the phone is visible and in an unbroken line of sight to the laser system, it will be able to be charged from across the room without having to be plugged in or placed on a charging base. This is not a replacement to a phone battery, which is still needed to power the phone, but this will be a separate outlet that people can use in addition to their normal charging ports. Three graduate students, Elyas Byati, Vikram Iyer, Rajalakshmi Nandakumar and their two faculty leads, Arka Majumdar and Shyam Gallakota, started this project about three years ago. After careful planning, funding was acquired from the UW and the team began building last spring. According to Iyer, the project was derived from previous experiments the group did with wireless charging. One of the big problems we have run into is how can we transfer enough power to charge something like a phone but still do that safely. They have been able to collect small amounts of power from small sensors or near-field charging, which Apple and Samsung already utilize with wireless charging stations. But this laser project aims to send power over much longer distances. When building their prototype, safety was their number one priority. They factored in additions like heat sinks to siphon off excess heat generated by the energy transfer. The prototype succeeded in being able to charge a cellphone at the approximate rate that a normal two-watt USB charger would be able to. The speed of the charging can vary depending on the size of the laser and receiver. 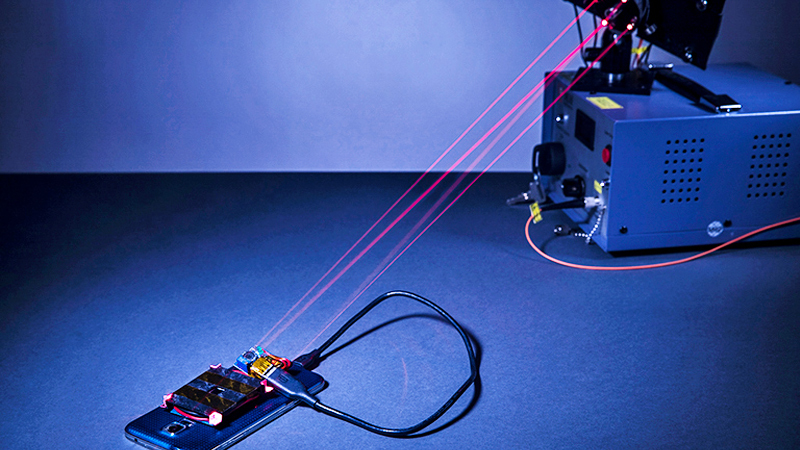 The more powerful the laser and receiver, the faster it can charge a phone. Now that the team has published their prototype findings, they are working to make the technology more consumer friendly, such as making the receiver smaller and keeping safety the major priority. NASA is researching a similar technology on a larger scale that would allow for wireless charging of spacecrafts in flight. Remote charging would allow NASA to push them even further into the solar system, instead of just building larger batteries and wasting valuable material. Currently, satellites and other space exploring technologies have what Majumdar referred to as a “half-life,” meaning after they are launched, they can only travel half their battery life, and the second half is used to travel back their base to recharge. The system allows for a larger freedom of movement when charging, as the phone is not tethered to a cord or base, and on a larger scale, the machines will not have to return to their home base to be recharged after only using half their battery life. The system is still being developed for consumer and large scale use, but has the potential to change the way we charge.